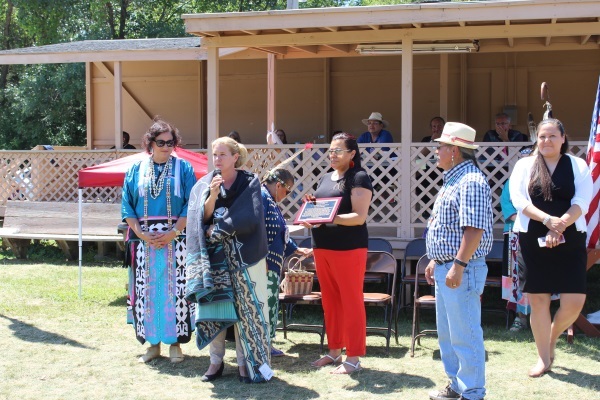 Ho-Chunk Nation President Wilfrid Cleveland presented state Representative Amy Loudenbeck with the Impact Award at 1:30 p.m. on Sunday, July 8, 2018, at the Neesh La Pow Wow at the Neesh La Pow Wow Grounds, E10793 N. Reedsburg Road, Baraboo, Wisconsin. Ho-Chunk Nation Representatives that were in attendance for the presentation was Representative Shelby Visintin, Representative Kristin WhiteEagle, Representative Kathy DeCamp and Representative Karena Thundercloud. Representative Loudenbeck was the chair for the Study Committee on the Preservation of Burial Sites and had assisted with the efforts of passing Assembly Bill 118, which passed in both the Assembly and the Senate. Governor Scott Walker wrote it into law on April 3, 2018. The Ho-Chunk Nation showed its appreciation of all the hard work that Rep. Loudenbeck had devoted with this small gesture to Representative Loudenbeck.